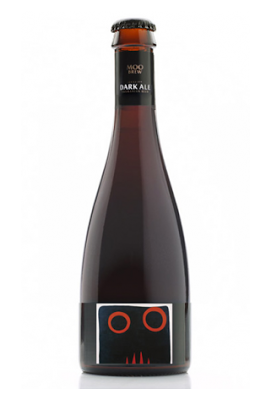 Moo Brew is the beer label of Tasmania’s Moorilla Estate, one of the apple isle’s oldest wineries whom make this range of brews on the side. Like the wines (which rarely seem to make it out of Tasmania these days) this is one finely crafted product. Dark (who’d of thought?) brown in colour, this pours with a lovely looking brown head. The nose is dark and grainy with some dense, dry, cocoa powder aromatics. Palate wise it’s dry, long and smoky in very much of a roasted and malted grain style. It’s almost confrontingly dry actually, like sucking on some 85%+ cocoa dark chocolate, which makes it something of a sipping, rather than sessioning beer. Still this rather serious, impressively concentrated, mildly confronting brew is nothing if not high quality. Good to hear you're still enjoying the Moo Brew Andrew. Do you have a favourite? Personally, I love the Hefeweizen as a stand alone, but I have been known to salivate over Dark Ale/Pale Ale black'n'tans this winter. I'm with you buddy. Hefe for me no question. On a recent trip to Tasmania I ordered a case of each Moo Brew (well, only two four-packs of the Imperial Stout at $25/bottle) as well as a case each of the Pinot Noir and Gerwurtztraminer sent up to Brisbane. Apart from the Pale Ale, they've all been either exceptional or exceptionally interesting drops, and I think the Dark Ale is my favourite product in the Moorilla line. It's interesting to me that you would call it dry, because I'd say almost the opposite. I find it remarkably refreshing for such a rich, heavy-in-flavour beer. If you haven't tried the Imperial Stout yet, do. It's very strange indeed. I'm not a huge fan, but it's certainly interesting – oddly sweet, but in a way I didn't expect and have never before noticed in a stout. It's an interesting question re: dryness. I guess we all perceive 'dry' quite differently, so nailing it down can be hard. But I'm with you on the Moo Brews. I had the Imperial Stout at the winery too and also thought it was beguiling. I came home with two mixed four packs, though eventually decided the hefeweizen is my favourite. Did they have any of the Syrah open when you were there Tom? I'm sad to say that I don't remember. Not from intoxication or anything, but if I did try it, it didn't stand out for me. Ought it to've? I find big, meaty shiraz difficult to drink, so maybe that's why. I was surprised with your review of the Taylors Jaraman 06. It was rare for a shiraz in that I found it, er, un-round (lean?) enough for me to want to drink without totally sacrificing that bite of tannin on the hard-palette. Do you have any thoughts on the Mountadam Patriarch 07?